Every day people are turning to the internet and especially Google to looks for car rental services. 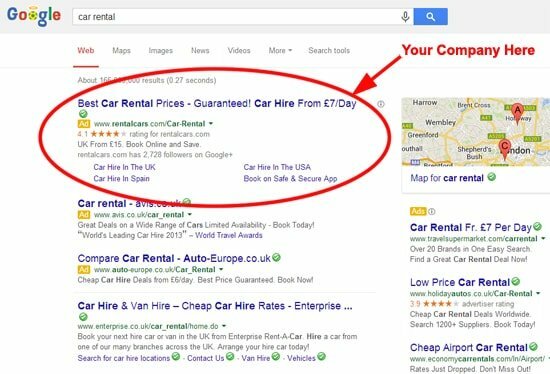 Every month on Google there are 550,000 searches for the term ‘car rental’ and 110,000 search for ‘car hire’. 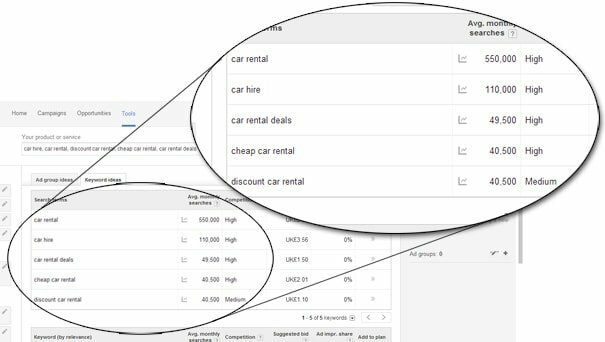 Other popular related terms include ‘car rental deals’ which gets 49,500 searches whilst ‘cheap car rental’ and ‘discount car rental’ get 40,500 each every month. These figures demonstrate the potential new client base that is available to your company through pay per click advertising with Google AdWords. At Trafiki we have a fully qualified Google AdWords team and are official Google Partners. This partnership enables us to make use of specialist tools that are provided straight from Google. One of these tools allows us to see what people are searching for and the image below shows that tool in action. With our help we can help the people searching on Google to find you and increase your business..
Google AdWords is a very effective form of generating new business through Pay Per Click advertising and with our help you will be ahead of your competitors and the results can be instant! Each day there are an astonishing 5,922,000,000 searches on Google, this equates to an 84% share of the UK search engine market! People used to look in the Yellow pages or magazines for a car rental firm but will now turn to the ease and availability of the internet instead. Without proper Pay Per Click advertising management a campaign can become ineffective and costly. Our Qualified AdWords team will ensure that your money is spent wisely and the correct people are looking at your business and the services that you provide. Being Google Partners we are able to offer £150 worth of FREE Google AdWords vouchers to any new clients who sign up to our services. With our help your company could appear here when a search is made on Google.